On my way to the furniture Salone in Milan, although not the shortest route, I made a meditative stop at Novy Dvur, the iconic minimalist monastery designed by John Pawson in Czech Republic. 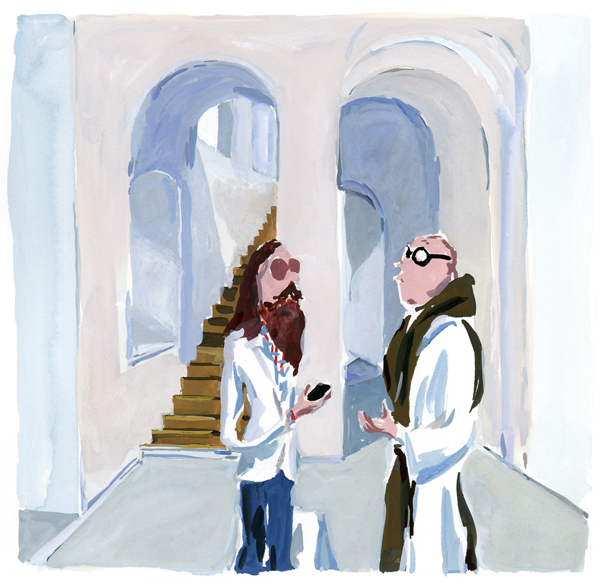 – Do you mean fascinated by the monastic life, or by the minimalist architecture? – It is such the perfect match! the architect serves an elevated purpose, and the simple lifestyle of his clients validate the architecture in return. – Isn’t it always like that? Don’t you think it works just the same when an architect designed a lavish house for a celebrity ? – I’m amazed that being monks you had the idea to choose John Pawson. – One of us had wandered into the Calvin Klein store in New York, which had been designed by John. It was so pure, nothing distracted from the product, it was shopping taken to a religious level. Wouldn’t it make a wonderful monastery, we thought, if we replaced Fashion with God? – In fact, unlike Calvin, we had a restricted budget, but this didn’t stop us from having discussions with John. – Minimalism is a luxury : it’s much sought after by those who have everything. – Just like us : we have nothing, but we have everything. – Did you think of having a fashion designer designing the robes? – It wouldn’t be as futile as it seems. Although I’m not sure it would give the same credibility to the designer as it gave to the architect. – What about tableware ? Did you have someone designing the plates and bowls ? – Are you thinking we are a boutique hotel ? – As a matter of fact, you must be constantly disturbed by architecture fanatics and style hunters? – We do have people coming in search of a spirituality, which is not always easy to find in all those flagship stores by prominent architects. Some are just looking for ideas to built their own minimalist house. I don’t blame them, although they should just look inside themselves. – Would you recommend to those saturated by materialism to do a retreat at Novy Dvur ? – Maybe not. They could become obsessed by architecture.